As the name suggests, Rustica is all about delivering a plain, simple and somewhat rural atmosphere. While the menu delivers elevated comfort foods with creative twists and pleasant surprises, the vibe throughout the room is anything but pretentious. It’s the rare kind of place you could either experience a nice evening out with that special someone, or sit down with a friend and converse over a pint, cocktail, or glass of wine. The bar shelving is custom made from what appears to be reclaimed wood and displays enough of a variety of premium spirits that finding a pour to suit your tastes is almost assured. Decorative touches of dried flowers and carefully chosen art serve to enhance the rural aspect. Located at 315 Main Avenue in Moorhead, Rustica has been a welcome mainstay for dining on the east side of the river since late 2014, and their half-price pizza special--during the happy Hours of 5-6pm and 9-11pm--is always a hit in the Tavern side of the building. A peppercorn bacon fat-washed Jameson Black is the centerpiece of this creation. To that, Kyle adds Fee Brothers butterscotch syrup, maple syrup from Maine, fresh-squeezed orange juice, orange-blossom water and egg white before mixing with a spoon and ice. 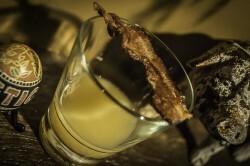 The drink is strained into a rocks glass, and served with a candied bacon strip laid across the glass as garnish. The orange-blossom water really helps the OJ cut through the smoky, peppery whiskey infusion in a way that leaves you feeling like you took the last sip of juice after your bacon and egg breakfast. Kyle fills a shaker with a white truffle-infused Casamigos Blanco, Luxardo Maraschino Liqueur, fresh-squeezed grapefruit juice, fresh-squeezed lime juice and Bitterman’s Hopped Grapefruit, and then does a wash of strawberry-infused Campari on a martini glass. The mixture is shaken with crushed ice and strained into that martini glass, filling it with a pretty pink mixture with a layer of crushed ice on top. A lime wheel with a fresh rosemary plug in the center is floated on top the ice as a final touch. This may look like a fruity, pretty pink martini but drinks like anything but. The rosemary garnish hits the nose first and hints at the deep savory flavors hidden within. Earthy truffle blends with agave and bitter hops, Campari and grapefruit and the strawberry and maraschino are buried deep under the earth and herbs. Tucked away in the alley behind the Fargo Theatre in the historic Lofts on Roberts Street building, Mezzaluna pride themselves on their takes on traditional American food. Much like the menu developed by Executive Chef Eric Watson, their drink offerings often consist of reinterpreted classics presented with plenty of creativity and fun touches of flair. This approach was vividly illustrated on this particular evening as Brooke and Langston pulled out fire, smoke, and sparks to entertain us as they composed their entries in this year’s showdown. The captivating displays seemed an appropriate representation of how the restaurant has revitalized this classy and historic building. Langston fills a shaker with Fernet Branca, Don Q Cristal, lime juice, hot water, and simple syrup and shaken before the “ritual” begins. 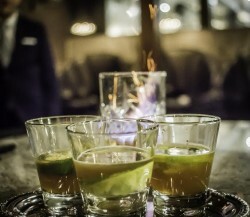 Bacardi 151 is poured into a muddling pitcher and lit on fire; then sprinkles of cinnamon are tossed in to create sparks in and above the pitcher before it is added to an inside-out lime shell resting inside a shot glass. The shaker is strained into the shell inside the glass and the lime juice blends with the simple syrup and lime shell to bring a refined citrus balance to what would otherwise be a deeply earthy and bitter drink. Fernet Branca is often called the “bartender’s handshake,” and its power to either make or destroy a cocktail cannot be overstated. Using San Juan Mezcal and Casamigo Anejo, Brooke adds to a muddling pitcher: brandy-infused cherry agave syrup and a vanilla extract that is also brandy-infused, before tossing in dashes of Angostura bitters, Fee Brothers orange bitters, Bitterman’s Tiki Bitters (cinnamon, allspice, island spices). She then pulls out a plate of rosemary sprigs that were dried with absinthe, and sets the sprigs on fire before placing stemmed cocktail glasses upside down on top of the burning rosemary, to fill the glasses with smoke. 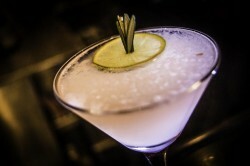 She stirs the ingredients and seasons the glasses with lemon zest that is left in the glass, before pouring the chilled drink in a way that causes a puff of smoke to seductively rise from the glass. 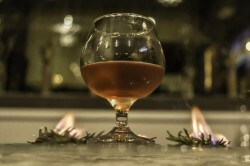 The presentation of this literally set the bar on fire with both an array of aromas as well as literal flames, and the smoked glass did a lot to bring the smokiness of the mezcal all the way through from nose to finish.